In preparation for Chardonnay Day on May 24th, we’re celebrating our three Summer White Wine Collections (Summer Heat, Ocean Sunset and Summer in the City). Summer was made for white wine, after all, especially from the Côte de Beaune. Available for a limited time only, and confined to a restricted amount of bottles, these unique collections of iconic white wine appellations saw three famous Burgundy chefs dare to pair our 2015 white wine releases with surprising Summer dishes, rewarding us with the best ways to beat the heat in the process. It doesn’t matter if you’ve cycled the Route des Grands Crus, survived a sweaty commute home after a long day in the office or are simply chilling out in your back garden topping up your suntan, a glass of chilled white wine is the perfect companion to cooling down during the hot and hazy sunny Summer days. While Chardonnay, like other full-bodied white wines, usually tastes better at cellar temperatures (55/ 12-13), on extra hot days don’t be afraid to chill the bottle in the fridge for 1-2 hours before serving in order to stay cooler for longer once exposed to the the sun. Alternatively, place your wine glasses in the fridge for the same length of time, to enhance that refreshing thirst quenching feel you get when you take that first, well-deserved sip. Much more rewarding than a cold shower. 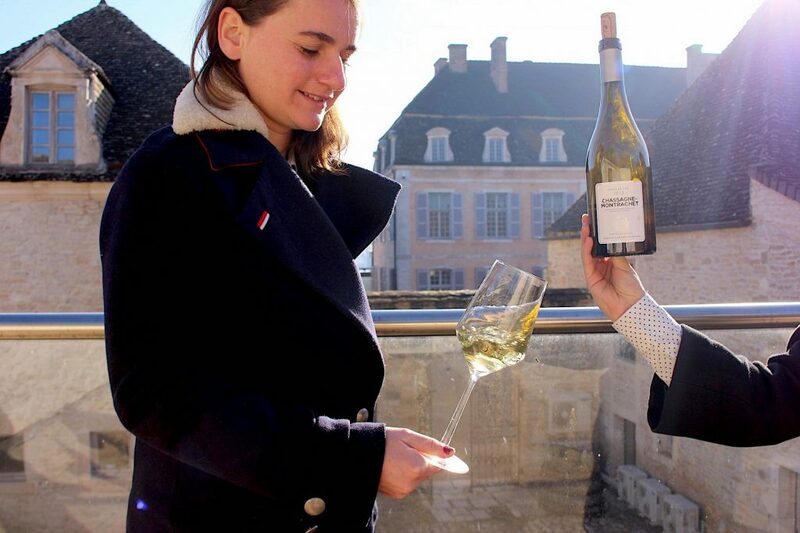 Day in the Sun: Wine Advisor Amicie swirls Chassagne-Montrachet 2015 in the sun, as Château Micault shines in the background. The Chassagne is part of the Ocean Sunset, Summer Heat and Summer in the City campaigns. The Chardonnay grape may have been born in Burgundy two millennia ago, but in the intervening years it has proven its anything but a stay-at-home recluse. Chardonnay has a sense of wanderlust. It loves to travel. 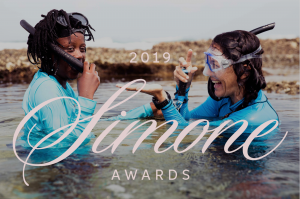 A robust grape that grows in large and plentiful clusters on the vine, Chardonnay vineyards can be seen in the far-flung fields of Italy, America, Chile, South Africa, Australia, and New Zealand – locations that all offer the distinctive tastes of their individual vineyards. Indeed, this is why we love this grape. It tastes like the vineyard from where it was born. 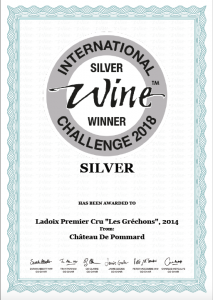 Take the Ladoix “Les Grechons” 1er Cru 2015, for example – no other wine on earth tastes as delicious and distinct as this wine. This is the taste of Ladoix, and it is the reason why, in Burgundy, we name the wines by the individual appellations, not the grape. As the the sixth most grown grape variety in the world, covering close to a half million acres, Chardonnay is at home anywhere in the world. But of course, the best comes from Burgundy. Just down the road from our house. 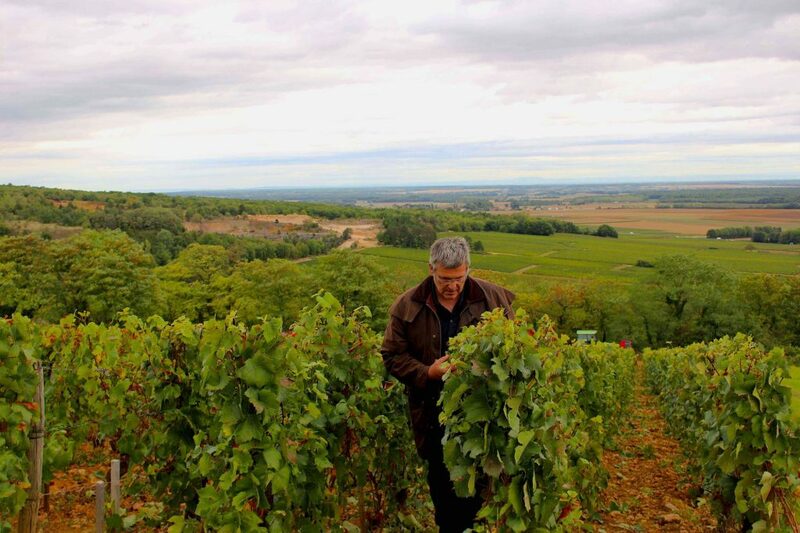 Ladoix 2015: Winemaker Emmanuel Sala inspecting the “Les Gréchons” parcel in Ladoix. 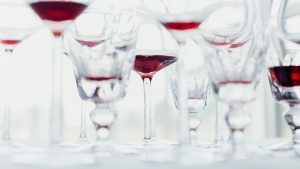 Much has been made of the health benefits of red wines, leaving white wines often out in the cold. However, of course, this white wine grape is bundled with brilliant health benefits that should never be ignored. 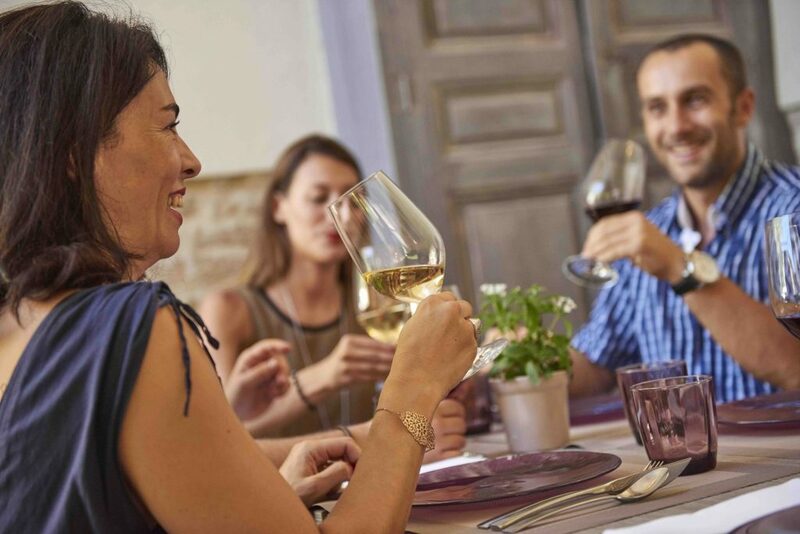 A glass of white wine includes the same flavonoids and antioxidants as red wines – two magic ingredients that (as part of a balanced diet) can help reduce the risks of heart disease. All White: White wines tend to be lower in alcohol and calories than red wines, with approximately 100-130 calories per glass. 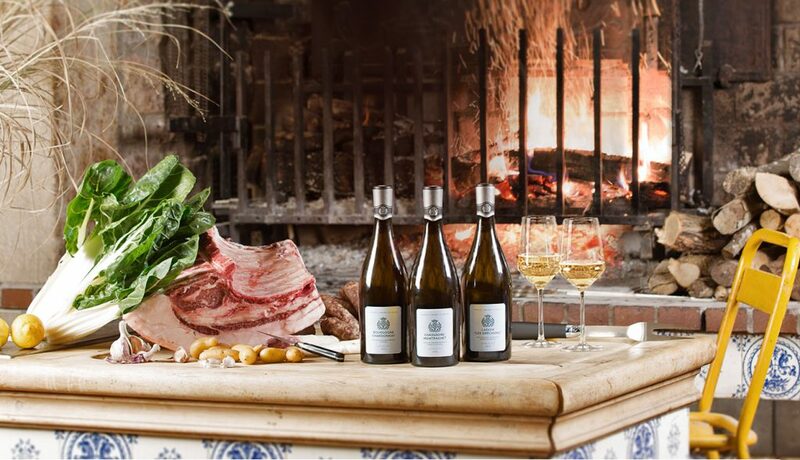 BBQs, picnics, Sunday lunches, after-work aperitifs – you name the occasion – white wines such from Burgundy love to be there. 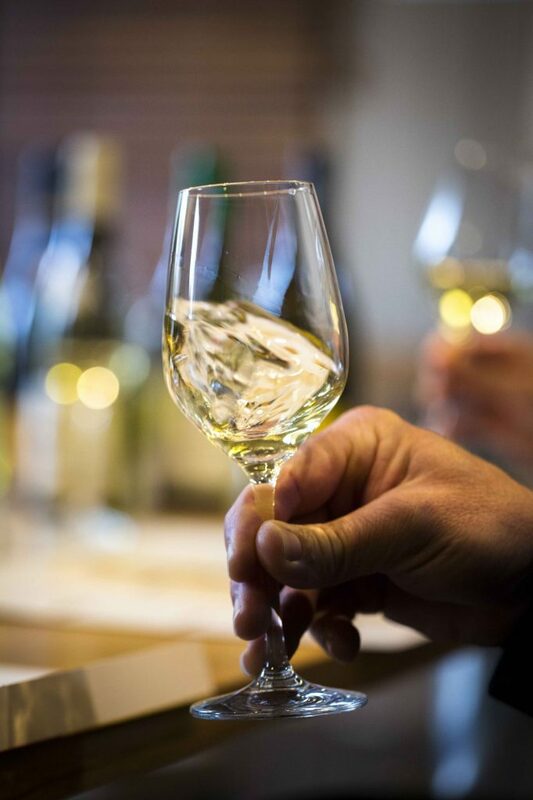 With their great concentration of aromas, well balanced by their famed refreshing acidity and with a complex variety of primary and secondary flavors on display, Burgundy whites make themselves indispensable at meal times. Except breakfast. Seafood and Eat: Michelin-starred chef Christophe Boquillon paired Chassagne-Montrachet Premier Cru 2015, Puligny-Montrachet “La Garenne” Premier Cru 2015 and Corton-Charlemagne Grand Cru 2015 with three exotic seafood dishes. 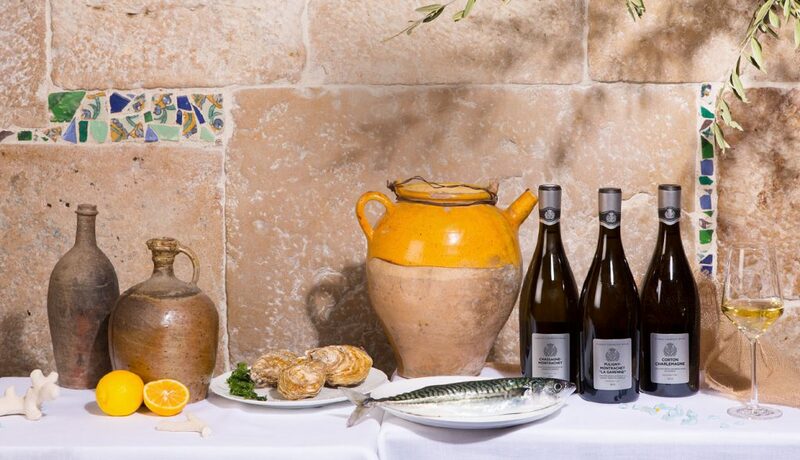 A richer white wine, such as the Corton-Charlemagne Grand Cru 2015, will pair better with meatier fish such as salmon or lobster – especially cooked in its shell on the BBQ – while a rounder more buttery Burgundy white, such as Meursault 2015, matches up with flaky white fish, scallops and skewered BBQ shrimp. Of course, there’s no rulebook to say you can’t pair a Burgundy white with steak! For those with seafood allergies, or don’t enjoy the flavors and textures of seafood, don’t worry there’s plenty more fish in the sea when it comes to pairing Burgundy whites with other foods. BBQ-roasted, or smoked, white meats such as chicken and turkey make for ideal alternatives, especially if marinated in plenty of lemon, rosemary and olive oil. For more wine and food pairings, check out our Cheese and Wine Pairing Challenge. 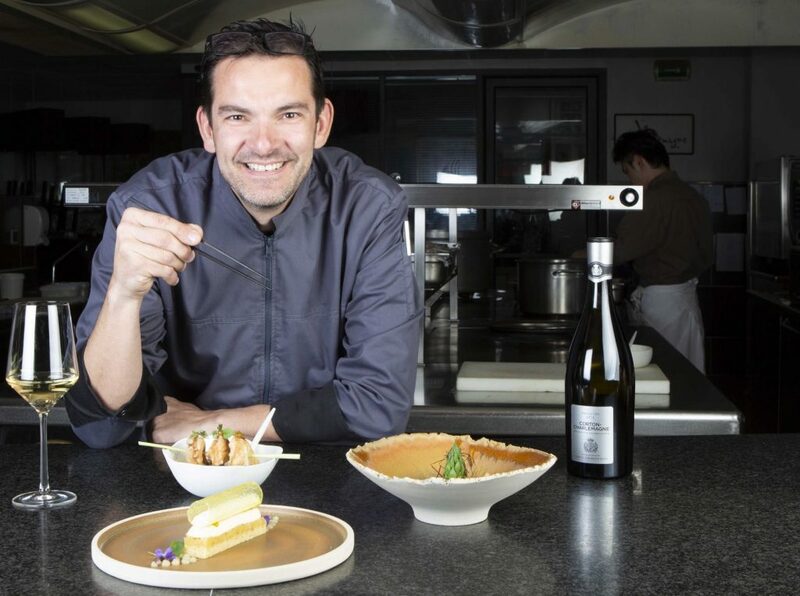 Masterchef: Laurent Peugeot, head chef at the award-winning Le Charlemagne in Pernand-Vergelesses paired Puligny-Montrachet 2015, Ladoix “Les Gréchons” Premier Cru 2015 and Chassagne-Montrachet Premier Cru 2015 with his three summer dishes for the Summer in the City collection. If there is one true taste to describe the experience of Summer then Côte de Beaune whites are on the wine on the tip of everyone’s tongue. No other wines on earth can transport the mind to a far-flung beach locale as much as a wine from Meursault or Puligny-Montrachet. With their well-balanced flavors and aromas, refreshing acidity and golden hue effectively ensures you’re drinking pure, smooth sunshine in a glass. Obviously, with their buttery yellow color and lemony opacity a glass of Chardonnay even shines like the sun. If you’re looking for the perfect beach wine, then we can recommend our Chassagne-Montrachet 1er Cru 2015. The wine is clean, with pronounced intensity aromas of pineapple, passion fruit, vanilla, butter, cream – all the fresh and fruity ingredients that the body craves sunbathing beside the sea. To see Wine Advisor Marion taste a Burgundy white the Burgundy way click here. 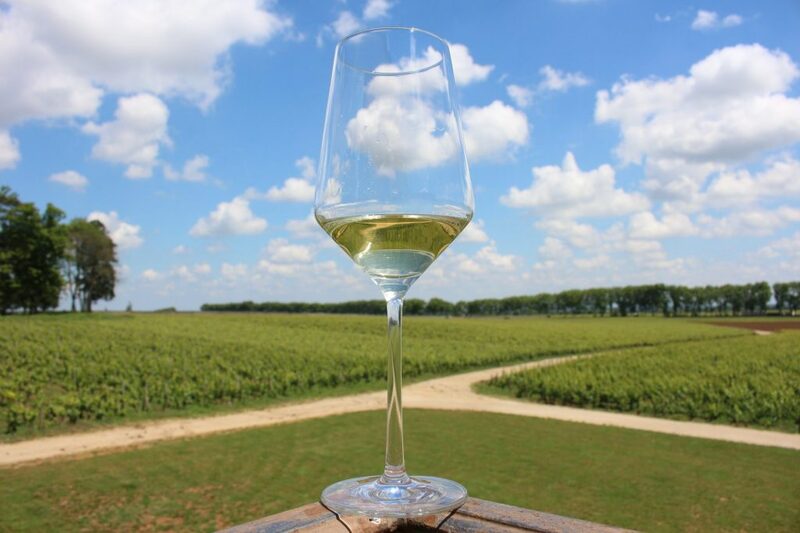 Sunshine in a Glass: White wines from famous Burgundy appellations make the best after work aperitif. We are proud to announce that two of our Summer White Wines Collection appellations, Chassagne-Montrachet Premier Cru and Ladoix Premier Cru “Les Gréchons” have just been awarded the Gold and Silver medals respectively at the International Wine Challenge, the UK’s most influential and important wine competition. We do take pride when one of our wines is singled out in such competitions. To have two of our family white wines sitting pretty on the IWC podium is an honor we don’t mind sharing. High Score: Chassagne-Montrachet Premier Cru and Ladoix Premier Cru “Les Gréchons”, two wines from the Summer Heat and Summer in the City campaigns won major awards in May 2018. Feel the Summer Heat: Thomas Collomb, head chef at La Rotisserie du Chambertin, paired Bourgogne Chardonnay 2015, Chassagne-Montrachet 2015 and Ladoix Premier Cru “Les Gréchons” 2015 Premier Cru with three original Summer dishes. It was reported that the very warm, dry growing season of 2015 yielded Burgundy’s fleshiest, most opulent white wines since 2009. As Decanter reported, “The 2015 whites are clean, pure and rich, favoring ripe orchard and soft citrus fruits over minerality, as is typical of very warm, sunny years.” A bright future awaits this sunny vintage! To learn more about our Summer White Wine Collections, head on over to www.chateaudepommard.com. Order your collections before June 25th, 2018, and receive your white wine before Summer gets white hot! 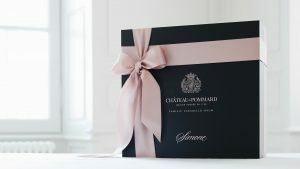 CHÂTEAU DE POMMARD, POMMARD FRANCE, FRIDAY, JANUARY 25TH OUR ULTIMATE COMMITMENT Simone 2016, the new vintage of Château de Pommard’s iconic wine, is now available.